My colleagues who are accustomed to the more staid conferences for upper grades delighted in some of the great hands-on presentations in the ballrooms. Think Lisa Murphy, the Ooey Gooey Lady, Steve Spangler Science, and a host of performers including Ella Jenkins, Hap Palmer, Debbie Clements (outstanding costumes), and Charlotte Diamond. Performance-based presentations are what teaching young learners is all about, and these were but a few of the presenters being ooohed and ahhhed about. The first day I walked the exhibit floor with one of TCR’s authors, Stephanie Lester, a wonderful science and literacy presenter and educator. She is my personal goldmine/sounding board when it comes to finding new product ideas and discussing teaching strategies that really work. We were both thrilled to see so much emphasis on science, hands-on learning, and open-ended activities. It was a great privilege to hear Patricia Polacco speak from the heart about what drives her storytelling. Like many long-time teachers, I have many of her books. She shared details of her upbringing, her struggle with dyslexia, and her current community projects. She ended with a plea that we continue to cuddle up and read to children, at least twenty minutes each and every day, and that we do more to support young parents. She was inspiring on so many levels. I bet everyone in the ballroom went home and read to someone. I was thrilled to hear that imaginative or dramatic play was a common thread in presentations on pre-reading and writing, STEM subjects, and outdoor play—Imagination is crucial to developing critical thinkers in the 21st century. Finally, and thankfully, the increased focus on better nutrition and physical activity was everywhere. It was stressed in presentations, in the food samples, and in new posters, games, and books for teachers, parents, and students. I came away from the 2010 NAEYC conference more convinced than ever that to educate young students we must remember that PLAY is the way that they learn and that we should encourage children to be active, engaged and inquisitive. We should nurture the creativity and imagination in each and every child! No money, no time, limited opportunities for class field trips these days? No worries—go virtual! You don’t need permission slips, chaperones, or transportation. You don’t even need to buckle up. But don’t kick back and relax just yet—you DO need to plan, preview, prepare, and present and review any trip, virtual or real. Virtual field trips can be as simple as a photo display of the monuments in Washington D.C., or more involved with interactive videos and additional links. A virtual field trip can take you and your students to a museum, zoo, battlefield, historic home, or outer space. You can stimulate student interest and enhance studies of a wide variety of topics. Use trips to introduce a lesson, highlight an era in time, or clarify a scientific concept. Once you get the hang of it you can start creating a library of audio/visual experiences to enjoy in the comfort of your classroom. You might even be motivated to start creating your own field trips. These trips can be taken when the topic presents itself or the mood suits. First you need to see if a trip is available for a topic you are interested in. A good place to start might be history.com/topics if you are not certain what subject matter is available. If you are studying early U.S. history/American Revolution, www.history.org might be just the ticket. Check the Multimedia section for video, podcasts, etc. Studying space or the solar system, and want to upgrade the old Styrofoam planet display? Try www.space.com/solarsystem/ and take the virtual space tour. No, it isn’t an IMAX experience or a thrill ride, but with the narration, music, and graphics you could be sitting in a spaceship or a fancy lab. Click and learn about a variety of things, planet by planet. Another site with a wide variety of virtual field trips is www.tramline.com. If you are still unsure, take a quick trip and see if you like this mode of travel. It may take a while to find sights of interest, but it is an effort worth making to add a little something extra to your class presentations. Take the trip yourself and make certain it is appropriate for your students. Check the links, too. Note ones that will enhance your study and a make sure none would be problematic. This is a must before each trip. Sites sometimes change or disappear. You don’t want to cancel a promised event at the last minute, and you certainly don’t want to see something inappropriate that wasn’t there last time! Once you have familiarized yourself with the trip, you may rethink your whole lesson. Decide what type of preparation you and your students should do before your excursion. Will the virtual tour serve as the opener for a new area of study or will the class need to do some research beforehand? Might some vocabulary development prior to the experience help? Double-check your standards, too. You might be able to address a number of them with one trip. Take cues from students’ responses during the presentation. Note what is catching their interest. Is the response what you expected? Jot down key phrases or remarks made and address them after the viewing. Incorporate as much time as possible to discuss the tour. Most of the educational sites you will go to for virtual tours, podcasts, and videos have sections for educators. Many offer ideas for follow-up activities and materials to help with review. You might wish to combine them with your own to further enhance studies. Reflect along with your students. What was the most interesting part of the presentation? What did you learn? Was there a least favorite part? Would you view it again? How can you extend the experience now, and next time? Have you taken any great virtual field trips? Let us know! My biggest concern as an Early Childhood editor, has always been, “How do I make an educational book a hands-on experience for students and still user-friendly for a busy teacher or parent? Hands-on activities are crucial for young learners—but how do you convey those experiences within a book? 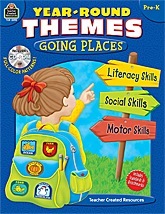 Kim Fields, one of TCR’s fabulous authors, does it in her new book, Year-Round Themes: Going Places (Pre-K). It is filled with engaging activities, interactive minibooks, songs, and stories that will entertain and educate young students. Kim and her four year-old son, Isaac, presented her book and its materials to friends and family at a festive author party she held in her home. Kim is our guest blogger. Here is her story. As a former teacher, I understand the power of thematic units. I researched what type of thematic books existed for the Pre K market and talked with Pre K teachers about their needs and interests. Then, I developed a book proposal and samples that presented my research and my ideas for the content of a book. I approached a TCR managing editor to submit my idea. It was a go! It took approximately two months to research and develop a proposal, nine months to write Year-Round Themes: Going Places, and the rest of the time was in the production process. From start to finish, it took about 18 months to create the book. After Year-Round Themes: Going Places was published, I held a book launch party to celebrate with family and friends. As part of the event, I had each guest fill out a passport—just like the one in the book. When they visited each thematic station, they were given a sticker as a “stamp” declaring they had visited that place. 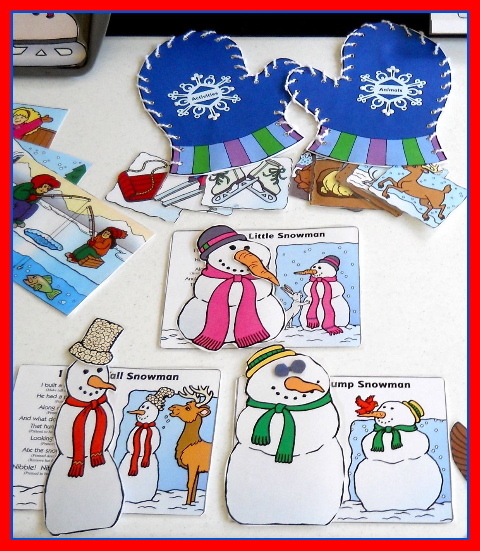 Thematic TCR stickers are the perfect size to fit in the blank box on the passport page! I supplied a thematic menu, based on the five units in Year-Round Themes: Going Places. 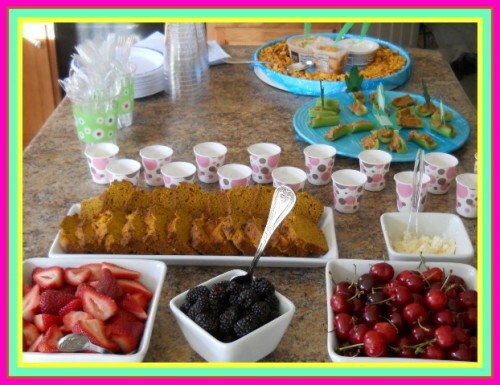 You might decide to use some of these yummy ideas as you celebrate the end of each unit with your preschool-aged children! 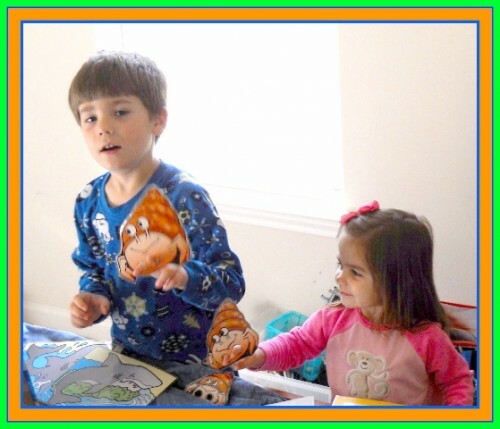 My friends (big and little) had a ball testing the interactive rhyming stories, complete with finger puppets, stick puppets that insert into scenes, and characters that “stick” to habitats with help from Velcro! 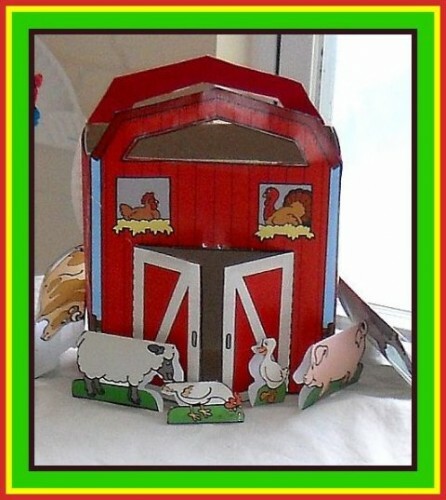 Adults were amazed by the souvenirs like the 3D barn (made from a cereal box) and animals that the children could create to take home to share with their friends and family, reinforcing what they had learned during their stay at each “destination” station. Thanks for guest blogging, Kim. I hope everyone enjoyed reading this as much as I did! We love your book and everyone at TCR got such a kick out of seeing your party pictures. We are always open to hear what’s working in other classrooms too! Let us know, we would love to hear from you. 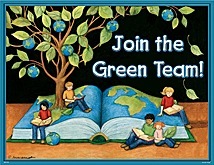 How Green is your classroom? We are a nation going Green. There are ads for all kinds of products and services, all touting ways to take better care of our planet. Everywhere we look, there are new ways to reduce, reuse, and repurpose products. My favorite going Green ad is for Goodwill. Who would have thought it was Green to shop there, but it is, and the stores are capitalizing on the concept to draw in new shoppers! Shopping at Goodwill and other “thrift” stores allows us to reuse items. Further, shopping there reduces the need to purchase new items and the often-excessive packaging that comes with these purchases. This is another assist for those growing landfills. What are you doing in your own home? Are you recycling? It is hard not to with the many special, color-coded cans most cities provide. It is the same with saving water. Why not incorporate green landscaping ideas into your spring planting this year. There are so many types of drought-resistant plants, and they don’t have to look like, or prickle like, cactus. It is hard to imagine going paperless at a publishing house, but at TCR we are doing what we can in our offices and of course providing E-books for all our books, to enable you to use pages as needed, thus saving paper and space in your classrooms. So, how Green is your classroom? Do you have students using both sides of the paper? Do you recycle the paper after both sides have been used? Do you have a recycling area to collect cans, bottles, etc.? Did you know your old Elmer’s Glue bottles and sticks can be recycled? Find out how at www.elmersgluecrew.com. Are you ready to do more, but just don’t know the next logical step? Green classroom ideas abound, and now would be the perfect time to implement them. The 40th anniversary of Earth Day is April 22. It is time to commit to working together to learn more about protecting and improving our environment. It is not just about recycling! 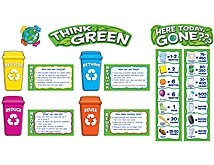 TCR’s new series, Going Green, provides many cross-curricular Green activities for your daily curriculum. 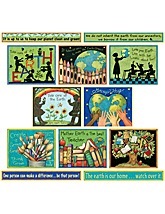 Challenge students to brainstorm ways to reduce, reuse, and recycle in their own neighborhoods. 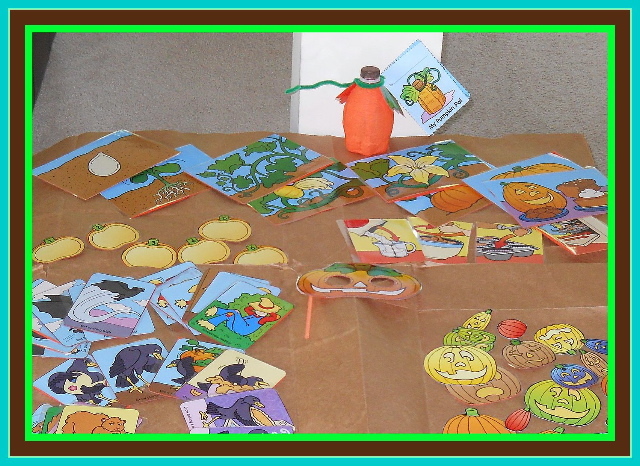 For more great ideas, check out TCR’s many Green bulletin boards, charts and decorative items.